The Perseus Arm is one of two major spiral arms of the Milky Way galaxy. The second major arm is called the Scutum–Centaurus Arm. The Perseus Arm begins from the distal end of the long Milky Way. Previously thought to be 13,000 light-years away, it is now thought to lie 6,400 light years from the Solar System. 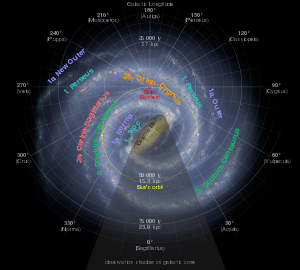 The Milky Way is a barred spiral galaxy with two major arms and a number of minor arms or spurs. The Perseus Spiral Arm, with a radius of approximately 10.7 kiloparsecs, is located between the minor Cygnus and Carina–Sagittarius Arms. It is named after the Perseus constellation in the direction of which it is seen from Earth. There is speculation that the local spur known as the Orion–Cygnus Arm, which includes the Solar System and Earth and is located inside of the Perseus Arm, is a branch of it, but this is unconfirmed. This article uses material from the Wikipedia article "Perseus Arm", which is released under the Creative Commons Attribution-Share-Alike License 3.0.